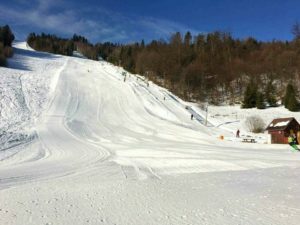 The ski resort SCM Mraznica is located in the area of Hnilčík – Roztoky, what is the budget-friendly regional ski resort that can easily surprise you with the quality of their ski slopes. The longest one is 1 650 m long with the height elevation of more than 300 metres. For the kids or beginners, there’s a 100 metres short ski lift too. A snack bar, hostel, ski rental office and ski service is right next to the slope. The ski resort SCM Mraznica offers the cross-country skiing within their Grajnár area. You can find 4 marked machine-maintained routes there for the cross-country skiing.